manage your law firm, and grow your practice. Conduct lightning-fast legal research with rock-solid results. Our unmatched content collection, backed by the industry's most rigorous editorial quality, is well organized for solo practitioners and small law firms. Your browser is not compatible with iFrames. 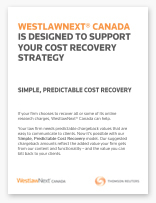 Litigation research on WestlawNext Canada connects with practical tools for evaluation, pleading preparation, arguing motions, trial preparation and more. Litigator combines litigation-focused research with practice-specific tools to support your strategic decisions and automate your most tedious tasks. Our practice-specific products have been developed specifically to match how research is done in each practice area. You can choose from any of the following practice area products to create a customized bundle that would best serve your firm’s needs. Plus: Discover our reporting system that includes suggested chargebacks that will help you to provide your clients with alternative fee billing arrangements. Take a look at our Suggested Chargeback Brochure. Offer actionable advice faster, draft documents in less time, and quickly find the in-depth how-to guidance you need across a broad array of practice areas with Practical Law™ Canada. When clients or business partners turn to you for guidance, start with Practical Law Canada's know-how to help inform your answers.